Campaign signs outside the Bellevue Library. 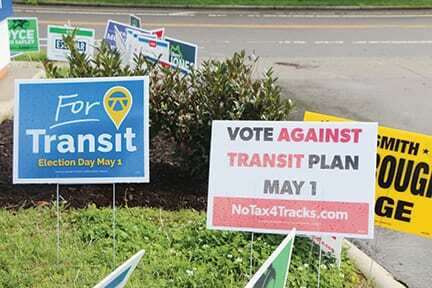 Voters will decide the fate of the Transit Plan on Tuesday, May 1. The Transit Plan is like a coat of many colors. It was made from bits and pieces of earlier plans like the AMP rapid transit proposal (2015) and the Metropolitan Transit Authority’s nMotion plan (2016). The Let’s Move Nashville transit plan borrows from both. It is a mosaic of traffic corridors, light rail lines, and development districts where cars, buses, and trains will one day move people all around Davidson County and reduce traffic congestion. It will cost $9 billion and take at least 15 years to complete. In broad strokes, the plan also addresses one of the city’s most intractable problems: fewer and fewer working people can afford to live in this city anymore. So moving Nashville forward is also about affordable housing, jobs, and economic development. The voting public will decide the plan’s fate next Tuesday, May 1. The Metropolitan Transit Authority (MTA), Metro’s Planning Department, Public Works, and several members of former Mayor Megan Barry’s staff played key roles in developing the current plan on Tuesday’s ballot. Let’s Move Nashville was first announced in April 2017. Public Works spokeswoman Cortnye Stone said the plan started to take shape in May 2017 after the passage of the IMPROVE Act which provides state financing for local transportation projects. “HDR Engineering was the consulting firm that advised us on the downtown tunnel and how to connect the Northwest Corridor rail line to the planned light rail system so it would be fully integrated with the rest of the system,” Stone said in an email. The finished Transit Plan was released in October 2017. 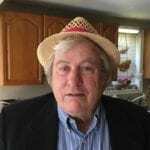 Barry convened a stakeholders group in November 2017 to advise her on equity issues, but, according to At-Large Councilman Bob Mendes, the advisor group wasn’t formed until after the plan was fully baked. “Absolutely nothing from the taskforce was built into the plan because the plan existed first,” Mendes said. A commercial real estate owner in Donelson says the development plans described in the Transit Plan will either concentrate poverty outside the urban core or won’t build enough affordable housing to put a dent in the deficit of 19,000 affordable units needed in Nashville right now. “The highest density portion in each of the 19 districts is a two-block square area within walking distance of the train station or proposed transit stop,” said Floyd Shechter, owner of Smart Space in Donelson. His company owns 12 office buildings there. He asked MDHA about its plans to build and what property owners can build based on the Transit Plan but hasn’t gotten any answers. “It says nothing about what they are going to build. There are no limits. There are no minimums. There are no anything,” Shechter said. There were five community meetings held in Donelson and, according to Shechter, everybody who attended them was opposed to what MDHA was proposing. Davidson County is 530 miles square. “Let’s assume you’re waving a magic wand and you create 19 of the districts tomorrow and the high density portion totals 14.25 square miles. If you build 19,000 units, how many units is it per square mile? It’s over 1000 units per square mile. You can’t do that,” he said. He noted that with a ten percent set aside for affordable housing that would mean building 1,000 units of affordable housing within a quarter square mile area. “It’s a bad idea to concentrate poverty period,” he said. Shechter said the Transit Plan adopted the standards of Donelson’s 10-year old Urban Design Overly (UDO) plan except for a 2X2 square block area where MDHA plans to build much higher density housing. The original UDO was for a moderately low density Hillsboro Village-type center for Donelson and property owners could opt out if they wanted to. It is not clear what they will be able to do if the referendum passes.